Dog Harness for Dog Agility & Flyball MADE IN THE USA – Custom Label Dog Harnesses! Add your own custom patch to your dog’s harness! Custom label harnesses for dog sports. 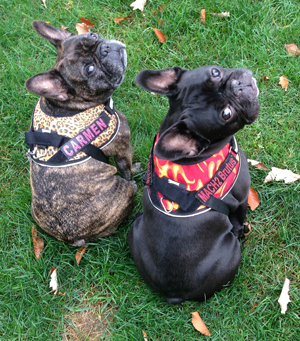 Design a custom patch to go with your dog’s harness! Choose from a wide variety of color and design options and then select a custom label to go with your harness. Each harness has two sides with removable velcro labels. Put your dog’s name on his harness or your favorite nickname. Great for service and assistance dogs too!